This week City Council voted to approve the creation of two new TIF districts to fund infrastructure improvements related to two new “megadevelopments”, Lincoln Yards and The 78. Prior to the vote, there was an amendment made to each redevelopment agreement that increased the percentage of Minority Owned Business Enterprises (MBEs) that will be hired as part of the project from 26% to 30% and Women Owned Business Enterprises (WBEs) from 6% to 10% for both projects. Despite these last minute adjustments and improvements to the deals, I held firm on my “no” vote for each TIF district. I remain convinced that these projects require more community input and should have been ultimately decided on by the new Mayor and City Council, to be inaugurated next month. Furthermore, I am hard pressed to agreed that without public funding, a development between Lincoln Park and Bucktown (Lincoln Yards), and a development in the South Loop (The 78), would not be possible. I am committed to working with the new mayor and new council to continue to push these development agreements to better serve the city and to look for ways to add more community voices to the plans. On Monday evening, my staff and representatives from the Department of Water Management, Department of Forestry, and NPL, met with more than 50 East Andersonville neighbors to review a number of trees that may need to be removed in connection with a water main replacement project. Because the homes in this area have shallow private drains which lie above the water main, the contractors are bound to comply with Illinois Environmental Protection Agency’s and Chicago Plumbing Code’s regulations to replace the drain with ductile iron, 10 ft in each direction of the main, in order to protect against cross-contamination. Contractors have found that a number of trees are in conflict with the location of the drains. I am working closely with officials in the Water and Forestry departments to exhaust every option that might preserve the trees. Click here to read a Block Club Chicago article about the meeting. This week is National Library Week, a week to honor and recognize the contributions of libraries to our society. In Edgewater, we are fortunate to have a recently (2013) built Chicago Public Library branch that serves all of our neighbors, with programming for children, teens, seniors, and hosts many community events. We also enjoy the efforts of Edgewater Reads, a group that is responsible for building and installing more than 100 “little free libraries” throughout our community. The public library and our grassroots little libraries are examples of the creative and collaborative spirit in the 48th Ward. Rattleback Records, 5405 N. Clark St. & Cesca’s Margarita Bar & Grill, 5403 N. Clark St.
Edgewater’s First Ever Pet Mayoral Race Is Open!In our effort to make Edgewater the most pet friendly community in Chicago, we would like to introduce the first Annual Pet Mayor Campaign. We are pleased to invite you to nominate your pet to the Annual Pet Mayor of Edgewater Electionby the Friday, April 26th deadline.Candidates will be chosen by a committee from Care For Real, the 48th Ward Alderman’s Office and the Edgewater Chamber of Commerce. NOTE: Only six candidates will be chosen to campaign for mayor. Spring is here, and it’s time to apply for summer block party permits. 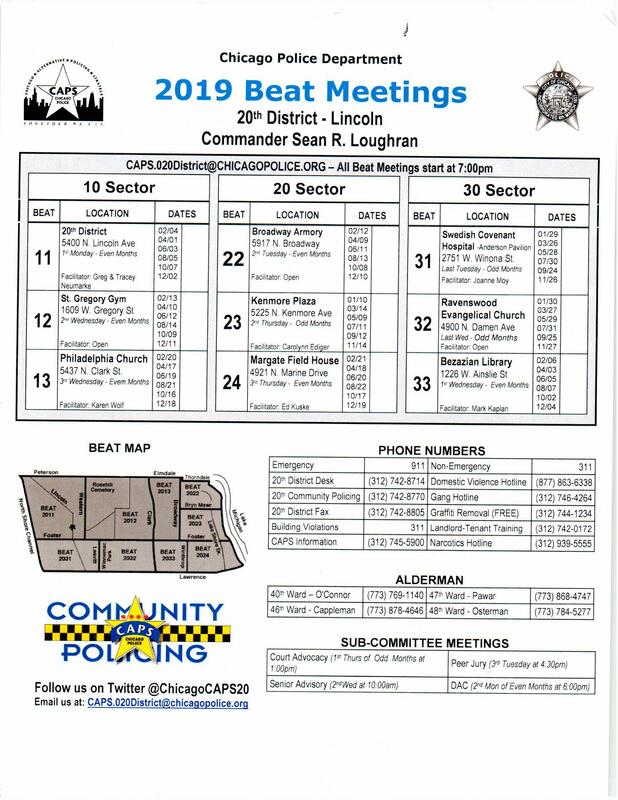 The attached information includes three forms – all available on the city and 48th Ward websites: the permit application, a letter to the Fire Department requesting a Fire Engine for your event, and a letter to the Police Department requesting a mounted policeman and/or canine patrol officer. Jumping Jacks will need to be reserved on-line at the link below on April 15, 2019. Regardless of whether or not you have your permit by then, PLEASE choose your date and enter the request for a jumping jack. They’re allotted on a first-come-first-served basis, and are limited in number for each weekend date over the summer. Our office has no influence on the jumping jack assignments. Click here to learn more about jumping jack assignments. NOTE: the DCASE website hasn’t been updated for 2019 yet, but will be available for use on April 15th, 9:00am. Send completed forms to our office at 5533 N. Broadway in person, via US Mail, or email to jerry@48thward.org. Street Sweeping Has Begun!It’s that time of year again! Street sweeping began across the city and in our community on Monday, April 1. 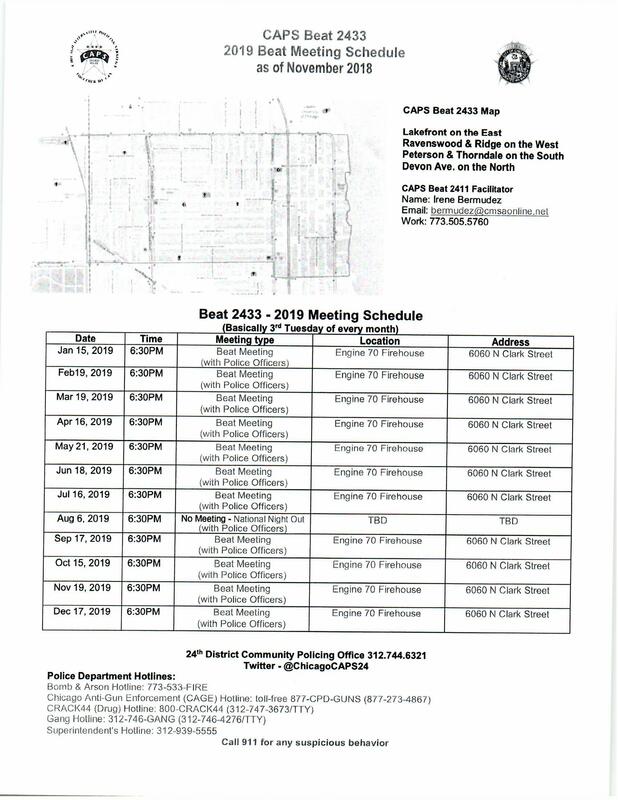 Click here to view the updated map of the 48th Ward Street Sweeping schedule. We recommend setting calendar reminders for yourself to ensure you remember to move your car and avoid getting ticketed. Earlier this week, an individual was taken into custody and charged with one count of attempted murder in connection with a shooting incident on Argyle that occurred in late March of this year. The incident occurred near 1023 W. Argyle. A conflict between two people took place on the block, and led to the subsequent shooting. Public safety on and around Argyle St. remains a top priority for my office and the 20th Police District. We will be reopening our Argyle Satellite Safety Office early this year, and plan to open in early May. If you are interested in serving as a court advocate for this case, please contact Alan Oviedo in my office at alan@48thward.org. The 20th District is hosting their annual Easter Egg Hunt on Saturday, April 20, 2019 from 12 pm to 2 pm. This year we have added entertainment and a magic show featuring “Mary Macaroni.” Mary is a well known kids entertainer who has been featured all over the Chicago-land area. We will have a visit by the Easter Bunny, an egg hunt, arts and crafts, and a magic show by Mary Macaroni. Join us for this fun fulled family event in the 20th District.Edgewater Wayfinding Signage Feedback Have you ever thought about what might make your experience getting around Edgewater better? The Edgewater Chamber of Commerce has.To help the Chamber identify signs or street furniture that would make your experience in Edgewater better, they’ve created a website to get your feedback.You can tell them about how you get around, show them some of your most traveled routes and choose images you like or don’t like. You can give your feedback online and then share with your friends and neighbors. If you don’t want to respond online, the Chamber is hosting an in-person workshop at the Edgewater Library April 13 from 1-3 pm.Click here for more information. North Side Community Federal Credit Union is one of the few HUD certified counseling agencies on the North side of Chicago. Their housing counselors work with clients to help them with some of the biggest financial decisions they will see throughout the course of their lives. This includes working with clients on how to safely navigate the home buying process, successfully overcoming debt and credit issues, and avoiding foreclosure if they are in default or imminent default. Chicago City Clerk Anna Valencia wants your help to review fines, fees, and collection practices in Chicago through the Fines, Fees, & Access Collaborative. The group will look at problems and potential solutions to the existing system and how we can advance reforms that work for Chicagoans and our City government. If you or someone you know would like to share experiences, ideas, and feedback, please click here. Apply NOW for the Edgewater Beautification Grants! Application for the Edgewater Arts Festival is open online at ZAPP til May 1st. Festival dates are September 28th-29th 2019. Hours of operation are Saturday 11-7pm Sunday 11-6pm. On Saturday, April 27, you and your neighbors can make an immediate difference in your community by volunteering for Chicago’s citywide Clean & Green Day of Service. Clean and Green is a great opportunity for residents, school groups and community organizations to team up and beautify areas in their neighborhood. The City will provide the brooms, rakes, shovels and bags needed for clean-up projects. A new conservation-focused collaboration between Shedd Aquarium, Brookfield Zoo and Lincoln Park Zoo to invite families to join in nature to improve the health of our planet. Click here to read the press release. We are excited to launch Party for the Planet® Spring into Action, a series of celebration and stewardship days from Earth Day (April 22) to World Oceans Day (June 8) providing the Chicagoland community with opportunities for families to volunteer and take action for animals and the environment. Activities include recycling opportunities, volunteering to pick up litter along Lake Michigan and the Chicago River, removing invasive plant species, and collecting important data through citizen science projects. Supported by the Disney Conservation Fund in partnership with the Association of Zoos and Aquariums, Chicago was selected as one of five signature events, other cities include Brevard, FL, Los Angeles, CA, New York City, NY, Philadelphia, PA, and San Francisco, CA. In total, over 120 AZA members will be hosting Spring Into Action events during the 48 days. For more information, please see the key dates below or click here. Saturday, June 1 at 10 a.m.-noonCommunity Passover Seder You are invited to join Chabad of Uptown for the Community Passover Seder Friday, April 19th 7:15pm @ Chabad of Uptown RSVP here. Celebrate Passover in the great company of friends, family, and community. The Passover Seder features a gourmet four course meal, hand baked Shmurah Matza, four cups of wine, Personal Hebrew, English, and Russian Hagadas, and beautiful insights into the Festival of Freedom. Click here for more information. It’s National Library Worker’s Week! Calling all volunteers! Please join us Sunday, May 26, 2019 for our biggest annual fundraiser, MB Bike the Drive, and support our work to improve biking, walking and transit in Chicagoland. Your time and talents are needed to help Active Trans produce a successful, car-free bike ride on Lake Shore Drive. There are pre-event, day-of-event and post-event volunteer opportunities. Choose the best job for you, whether it is fueling participants at rest stops, helping at a pre-event packet pickup event or keeping the event fun and safe. Volunteers slots fill up on a first-come first-served basis, so sign up today! We rely on the continued support and enthusiasm from volunteers like you – please visit www.bikethedrive.org/volunteer to register today! For any questions about volunteering, please contact Brittany Gillespie, Volunteer Coordinator, at brittany@activetrans.org or 312-216-0465. Territory is now seeking Design Team Facilitators for their summer studios. Lead a team of youth ages 14 to 19 using urban design and planning to re-imagine and re-claim public spaces in Chicago. Apply Now. Letter of Interest Due Thursday April 25, 2019.Under 20 & Ready To Change The City? Then Do It!Territory has jobs for youth ages 14 to 19 on our design teams. If you want to learn how change the city using urban design, apply now at After School Matters. Use keyword TERRITORY to search for our program. Schedule: July 1 through August 9, 16 to 20 hours per week.Interested In Volunteer Opportunities?There are lots of ways you can help our design teams succeed. Bring your team to our career day and share your work, or host our team for a day in your office. If this sounds like you, please fill out Territory’s online survey and we’ll be in touch. The CMAA Dim Sum & Then Some: The Uptown 5K will be held on June 1, 2019 starting at the corner of Sheridan & Argyle. In its first year, CMAA’s 5K fundraiser attracted 400 runners from all over Chicagoland. Last year, nearly 700 runners joined us, and this year we are on track to have over 1,000 participants! The race offers participants a unique route along our city’s scenic lakefront. We also treat our participants to dim sum, bubble tea and other local goodies at the end of the race, along with a block party as people are entertained by CMAA’s youth dance troupes as they perform traditional dances for the crowd. Proceeds from the 5K go back to supporting our agency’s clients. This year, our goal is to get up to 1,000 runners-so we are looking for a lot of volunteers! Volunteers are an integral part of of making sure this 5K runs smoothly. All volunteers arrive at 6AM and are done at 11AM. Each volunteer receives their own shirt, box of Dim Sum and Bubble Tea! To learn more about specific volunteer opportunities, email emilyo@chinesemutualaid.org. BYOB – Bring Your Own Basket! Camp Invention is back in Chicago Public School District! The ALL NEW 2019 Camp Invention® program, Supercharged, features superheroes, real fossils, programmable robots and more! Register your child for a week of collaboration, design and problem-solving skills in an energizing STEM program led by local educators. Camp Invention is for students entering grades K – 6th with leadership opportunities available for students in grades 7th – 12th. Queen of Hearts Pot should be over $50,000! You need to play to win! Tickets are 6 for $5. They can be purchased at the Double Bubble, Edge of Sweetness and the school offices. Maybe you will find the Queen! June 17-August 2nd- Reduced Early Registration Fee, $50 (by May 1) $100 (after May 1) Weekly Rates-Same as last year!! $225 per week (4+ weeks) $260 per week (less than four weeks) Discounted Sibling Rate-Same as last year!! $160 per week (4+ weeks) $200 per week (less than four weeks) Registration closes June 1. Extended Care Program available AM and PM. REGISTRATION IS NOW OPEN! For more information, go to NorthsideCatholic.org or call 773-743-6277. Board of Specified Jurisdiction- Recruiting new members! Your Parish School, Northside Catholic Academy, is kicking off its School Board Membership identification process for the 2019/2020 school year. The Board of Specified Jurisdiction is looking for candidates from our broad community which includes Parishioners, alumni/ae and parents of alumni/ae, leaders within the community (including business, education and other leaders), and parents. Who are we? Social media tells us one thing. Teachers, parents, and friends say something else. Every day we are defining who we are. 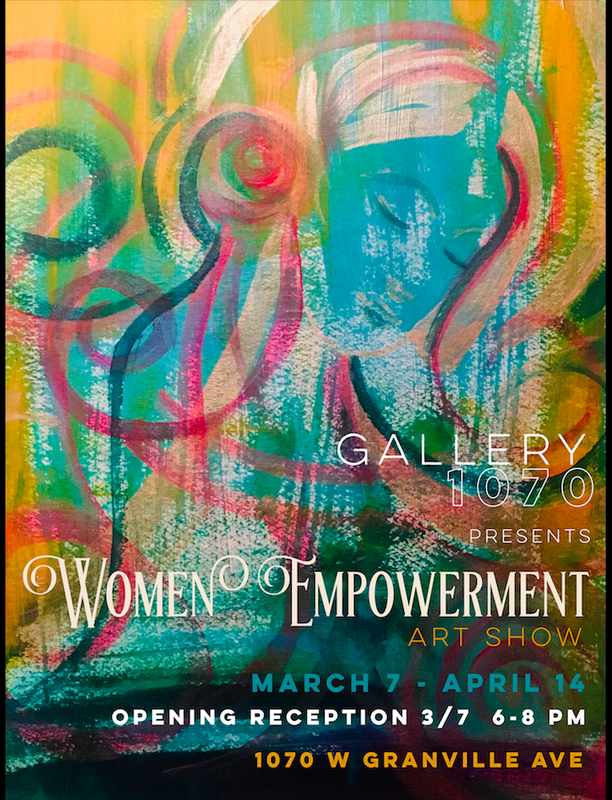 Select students of Uplift Community High School with art instructor Catina Robinson will have an exhibition of artwork around the theme of IDENTITY, April 26 – May 29, at Everybody’s Coffee, 935 W. Wilson, Chicago. 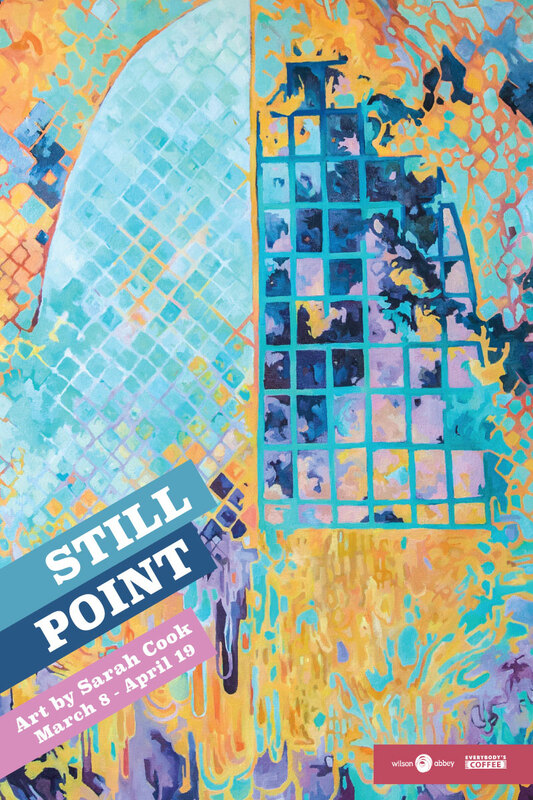 Opening reception is Friday, April 26. Art history has shown that self-portraiture has been a practice many artists have explored for centuries. In our current contemporary times the “selfie” could be viewed as a version of a self-portrait. These young artists have put down their cell phones to explore different art media and techniques such as scratch-board, collage, acrylics and mixed-media. With some contemporary influences to guide their work, various styles such as naturalistic representation, ornate contemporary and abstract expressionism will be on display. Join us for our Youth and Job Resource Fair on April 13th. Meet employers with full and part-time jobs openings and learn more about summer internships. 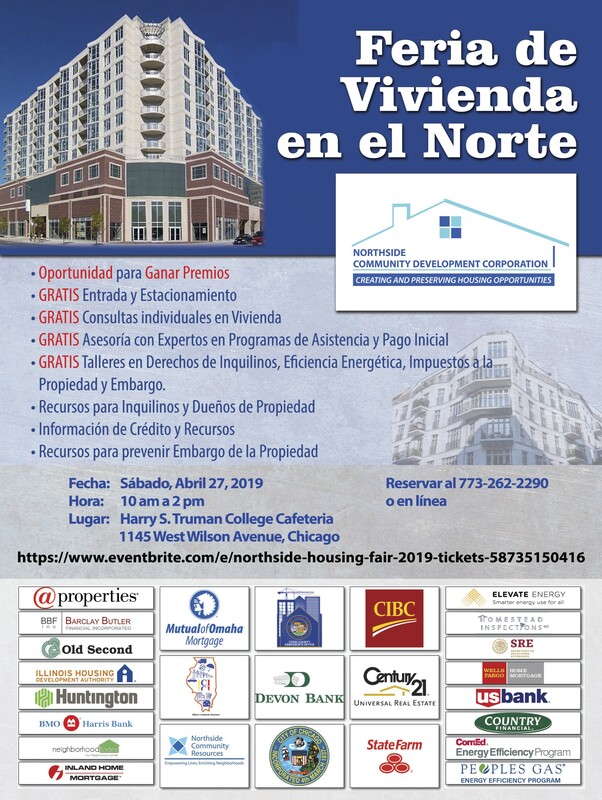 Click here for the flyer or visit the 48th Ward for more information! On March 18, Mikva Challenge started accepting applications from Chicago youth age 16-20 who are interested in spending their summer working on one of our policymaking youth councils OR in an elected official’s office. Students will be able to learn more and apply at http://tinyurl.com/MikvaSummer2019 . Deadline for students to apply: Friday, Apr. 26 @ 5:00pm. On March 15th, One Summer Chicago and After School Matters started accepting applications for summer job opportunities through out the city of Chicago. One Summer Chicago application deadline is May 20th and offers employment opportunities for more than 32,000 youth ages 14 to 24. After School Matters application is available via this link. After School Matters partners with a lot of local organizations to provide greater opportunities for teens in the 48th Ward and the city of Chicago. 48th Ward Youth Advisory CouncilThe purpose of this council began with our desire to make a difference in the way youth engage, learn, and participate in the community they call home. The council plans community events that will others in the community will enjoy. They get the opportunity to meet with other leaders in our community. If you want to learn more or have any questions contact PC at pc@48thward.org. Circles & Ciphers is a hip-hop infused restorative justice organization led by and for young people who are impacted by violence. Click here to learn more. Do you wanna dance? Put on your dancing shoes on Tuesdays (April 9-23). Learn swing, salsa, merengue and other Latin dances. You don’t need a partner for this intergenerational program. Free. 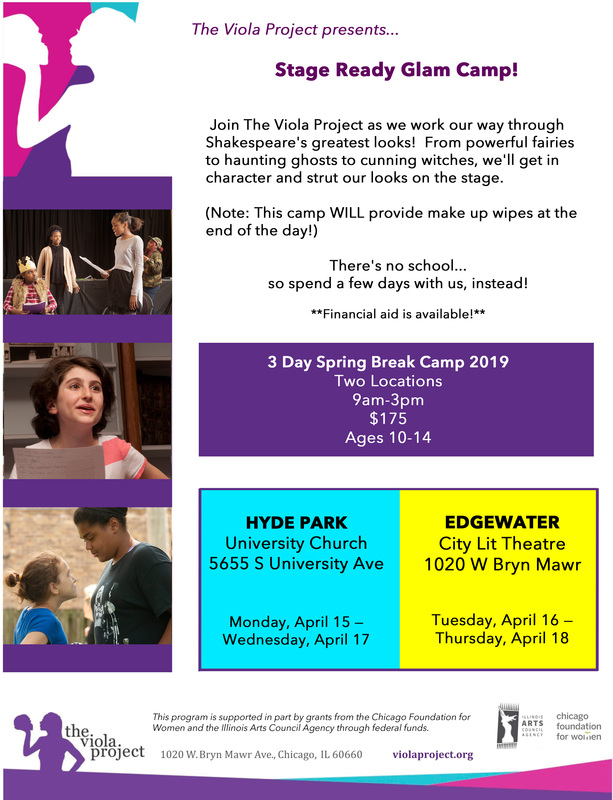 Read about other Edgewater Village programs; some require registration and are described on the April Schedule of Events. Learn to sail at Monroe Harbor—no experience necessary. A fun and educational summer experience for 5th-8th grade students in Chicago, on and off the water. Visit EndeavourChicago.org for more details and to apply online. Scholarships available. Click here for the flyer. Spring into programs offered by Edgewater Village What do gardening and palmistry have in common? They’re just two of the free programs that will be offered next week by Edgewater Village Chicago. Upcoming programs: “The Craft of Writing Your Story” and The Chicago Conspiracy Trial: One Juror’s Ordeal.” Both require registration as there is limited space. See details in the April Schedule of Events. Edgewater Library, 6000 N BroadwayJoin us to hear exciting news about the library and to meet library staff and members of Friends of the Edgewater Library, a nonprofit organization supported by volunteers who appreciate how libraries build strong communities. Find out what Alderman Harry Osterman is reading and share a title of a book you’re reading or recently read. Help make sleeping mats for the homeless out of used plastic bags. New Life for Old Bags is a non-profit organization, and the workshop to repurpose the bags is an intergenerational program. No registration is necessary; plastic bag donations are welcome. 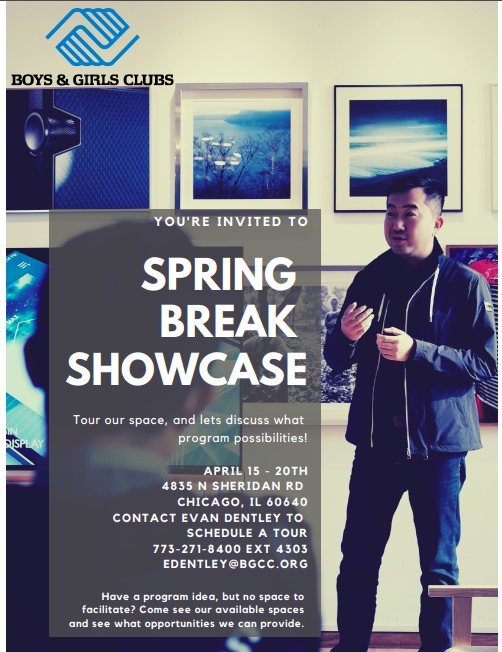 For more information, contact Stacy at (312) 742-5323. Senior Citizen Sewer RefundIf you live in a condominium, townhome, or co-op, and you are 65 years of age or older, you may be eligible to receive a $50.00 rebate for your share of the property’s sewer costs. The City mailed renewal forms to those who received the rebate in 2018, and if you received one of those, please sign it and mail/bring it to the Alderman’s office at 5533 N. Broadway, or scan and send it via email to jerry@48thward.org. If this is your first time requesting the refund, you’ll need to complete a form and attach three (3) pieces of information: a copy of your 2nd installment 2018 property tax bill, a copy of your Driver’s License or State ID, and a copy of the water bill from your homeowners’ association. The form can be completed online at this link: http://www.committeeonfinance.org/claims/sewerclaimform.asp. Alternatively, you can click here to download and print a form, complete it and return it to the Alderman’s office. For questions, please call the 48th Ward office (773-784-5277) or email Jerry Goodman at jerry@48thward.org. Powers of Attorney Healthcare / Financial ClinicThe Cook County Elder Justice Center in partnership with the Legal Aid Society of Metropolitan Family Services under the Elder Help Desk initiative is now offering a new Powers of Attorney Healthcare / Financial Clinic every 2nd and 4th Friday of each month in the Elder Justice Center. Please see the attached announcement for further details and begin sharing this information with your friends, family and colleagues. Click here for more information. Crews are nearly complete installing main for this project. The last 40 feet of main to go in will be near 1428 W. Balmoral, where there is a conflict with a light pole. Crews expect this conflict to be resolved early next week. Addresses on Balmoral between Lakewood and Glenwood are connected to the water main. Crews will begin pouring the concrete cap in this area tomorrow. Addresses on Balmoral between Clark and Ashland will be connected to the main beginning early next week, no residences are affected by this switchover. Following the work outlined above, the rest of the project is on hold until tree conflicts are resolved. My office continues to work with the Department of Forestry, Department of Water Management, and NPL to identify trees that will need to be removed as part of this project. No one is happy about the need to take trees down, and we are examining this issue exhaustively. This project includes the replacement of some personal drains. Illinois state law (IEPA Title 35, 18.10) and Chicago Plumbing Code require that personal drain (sewer) replacements positioned above a water main be constructed of at least 10 feet of ductile iron on either side of the main in order to prevent compromises to potable water. Drains on Farragut, Berwyn, Summerdale, and Balmoral are laid shallower than most and are positioned above the main. When crews dig trenches to install new personal drains on these streets, tree conflicts occur. At my urging, engineers have looked closely at all conflicts and have reduced the number of trees impacted by the project, but at the end of the day, there are still trees that need to be removed. We continue to hold weekly construction meetings on Wednesdays at 9am in the Andersonville Chamber of Commerce Conference Room at 5153 N. Clark, Suite 228 (North Side Federal Savings building). These meetings are an opportunity to hear an update from the contractor and to get any project-related questions answered. 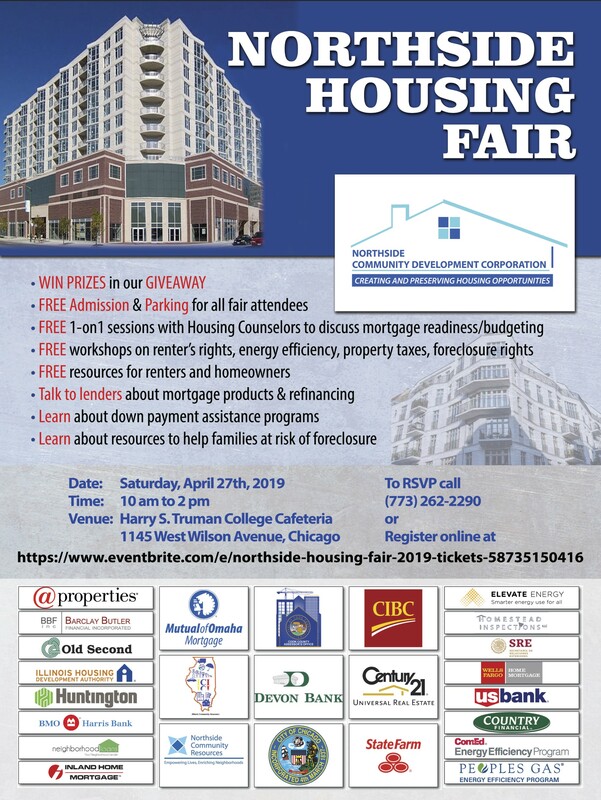 Any questions, please email harry@48thward.org or call our office at 773-784-5277. Alleys east of and parallel to the CTA Red/Purple Line between Leland and Foster and at all cross streets from Leland to FosterAinslie: Underground duct bank installation continued in the alley east of the tracks south of Ainslie. Ductbank installation is approximately 85% complete.Winona: Underground duct bank installation continued on Winona St. east of the tracks. Ductbank installation is approximately 100% complete.Leland: Underground duct bank installation continued on Leland in the NE alley. Duct bank installation is approximately 42% complete.Foster: Underground duct bank installation started on Foster and Foster overall is approximately 47% complete.Foster: Sewer main work in the center of Foster Ave. continues. Traffic remains open on the outside lanes. Goudy school parent detour continues without issue.Lawrence: Underground duct bank installation was completed in the alley north of Lawrence and west of the tracks.Alleys east of and parallel to the CTA Red/Purple Line between Foster and Balmoral and at all cross streets from Foster to BalmoralBerwyn: Duct bank installation in the east alley south of Berwyn did not take place last week. Ductbank installation is approximately 81% complete.Balmoral: Cable Pulling began in the east alley north and south of Balmoral and the west alley south of Balmoral last week.Alleys east of and parallel to the CTA Red/Purple Line between Balmoral and Bryn Mawr and at all cross streets from Balmoral to Bryn MawrCatalpa: Crews continued duct bank installation south of Catalpa in the east alley and is approximately 97% complete. Bryn Mawr: Underground duct bank installation continues in the east alley south of Bryn Mawr and is approximately 9% complete.Alleys east of and parallel to the CTA Red/Purple Line between Bryn Mawr and Thorndale and at all cross streets from Bryn Mawr to ThorndaleNo work observed.Parcel 31 Demolition – 1111 W. Bryn Mawr AvenueDynamic Wrecking – No work activity took place last week. Chicago Filmmakers has multiple events including film showings and classes. Click here for more information. The Northside American Job Center at Truman College has various events including orientation sessions on Mondays at 9:00 am and Wednesdays at 1:00 pm. Click herefor their March calendar. Chicago Magic Lounge has various events. Unity Chicago, 1925 W Thome AveSee the full calendar of arts events by clicking here. The Swedish American Museum has various events. Carol’s Pub has live entertainment events.